This image began as a photo that I took on January 14. I was in the passenger seat on the way home from Boston. 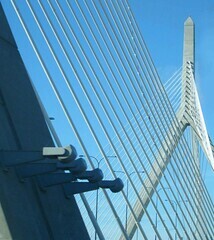 I wanted to see if I could get a photo of the Zakim Bridge with my new digital camera. It is certainly easier and faster to whip out my phonecam than to get my digital camera ready to shoot, but I could immediately see that the digital camera does a better job in terms of clarity. But what I didn't see while I was taking the picture was a fluffly white cloud behind the tower, in the worst possible position for the composition. So tonight I opened the image in Painter IX and blew the clouds away with digital airbrush. Then I cropped the image to focus on the diagonal lines of the bridge.